According to QS University Rankings: Asia 2014, National University of Singapore (NUS) tops the list with an over all score of 100. The over all score covers nine categories namely: academic reputation, employer reputation, faculty student, citations per paper, international faculty, international students, papers per faculty, inbound exchange and outbound exchange. Rounding up the list to top five are KAIST – Korea Advanced Institute of Science & Technology, University of Hong Kong, Seoul National University and The Hong Kong University of Science and Technology. 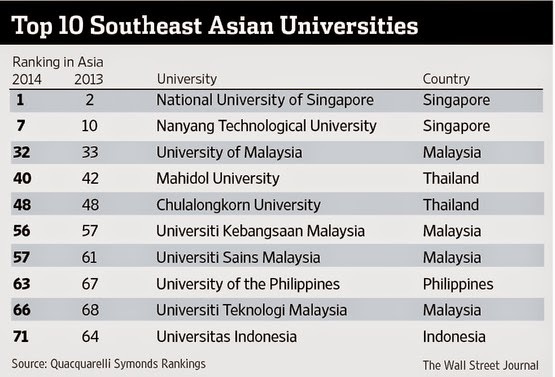 In Thailand, Mahidol University tops the country. In Asia however, it has only an over all score of 72.7, placing 40th on the list. Chulalongkorn University is at number 48 with an over all score of 67.4. The Philippines’ most notable university, the University of the Philippines, is only at number 63 and holds an over all score of 63 – 4.4 short of CU. The next PH university after UP is Ateneo de Manila University. It didn’t make the top 100. It has only 46.4 over all score, placing 115th on the list.